What Is Heat Shield® And How Can It Save Your Chimney Flue? Heat Shield® is the revolutionary method to chimney repair that everyone has been waiting for. By incorporating safety, function, and cost effective measures, Heat Shield® is chosen again and again by chimney experts, when looking to repair tricky damages. Missing or improperly aligned mortar joints in your chimney can cause a quick and dangerous fire to erupt in your house. Afterwards, your un-functioning chimney is now more prone to release hazardous chemicals into your home and atmosphere. Water damage, bugs, rodents, and other irritations have now found a new home in your chimney, leading to a multitude of additional problems. Heat Shield® help keeps your family safe, by protecting you and your loved ones from carbon monoxide fumes looming in your chimney. By properly ventilating your home from these hazardous chemical releases, you can ensure that these dangerous fumes are ventilating away from your home. Leaving you with peace of mind, Heat Shield® is designed to be the safest method of chimney repair to date. In order to protect the environment, we remove the process of eliminating bricks, and instead repair your existing foundation as is. All Heat Shields applications are installed by certified chimney repair professionals, who are trusted and licensed contractors in Michigan. This safe and thorough method of chimney restoration is 100% guaranteed to restore the integrity of your flue system, getting your chimney back in working order for years to come! Before the Heat Shield® method, homeowners were only left with the option of rebuilding their chimney. Through either steel liners that end up minimizing airflow, or other restricting alternatives, chimney repair was no easy feat. Heat Shield® is applied to flues that are breached, meaning that flue tiles have been cracked, sprawled, misaligned, or are missing altogether. The Heat Shield® method works to correct these destroyed flues, ensuring that your chimney is in working order and without airflow restrictions. Our experts will conduct a free video inspection of your chimney, before and after the Heat Shield renovation process, to provide you with visual assurance and impressive results. Rebuilding a chimney is incredibly costly, and the experts at Brickworks Property Restoration feel that you shouldn’t have to resort to such extremes. With our flue repair method, Heat Shield® is able to cut the cost of your chimney repair to one-third of price of rebuilding. Our chimney repair professionals are experts at working with insurance companies, to make sure your costs and fees are covered. 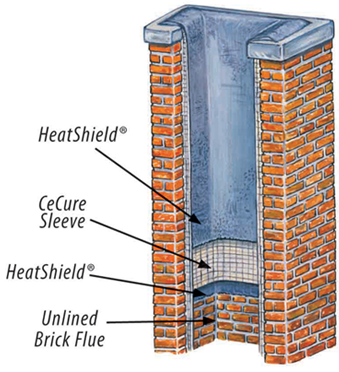 Rather than taking a chimney down, brick by brick, Heat Shield® completes the chimney repair process four times faster than traditional methods. This quick and effective method of chimney repair will not only save you time, and money, but you get a 20 year warranty from the manufacturer. Our 3 fold process of safety, function, and cost effective measures is what makes Heat Shield® the most reliable choice for all chimney repairs.